Last week a 24 year old woman went to a hospital in China because she was dizzy and nauseous. 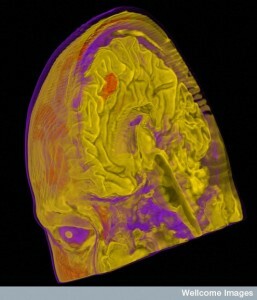 The doctors discovered that she had no cerebellum—the critical brain center with half of the brain’s neurons, related to movement and habit memory. As a child she was late walking and talking, but is now married and normal with a minor gait disturbance and slightly slurred speech. This most recent dramatic example of neuroplasticity shows, again, how the brain will alter itself to provide functions that once were thought to only exist in a specific region. Neuroplasticity creates new brain cells, new synapses and changes how regions function. Neuroplasticity mechanisms are responsible for most learning. It was once thought that neuroplasticity used a simple mechanism of strengthening synapses when firing frequently—the more firing, the stronger the synapse. This was called long term potentiation or LTP. In the past several years, more and more varied mechanisms have been discovered. Recent research shows that most brain activity, in fact, occurs with rapid millisecond communication in wide networks around the brain. This rapid circuit uses many completely different mechanisms of neuroplasticity at the same time. Thought triggers simultaneous multiple complex mechanisms in wide brain circuits. In an instant, a neuron that was part of one neuroplastic circuit, is now part of a different circuit, using one of its 10,000 synapses. Each new neuroplastic mechanism triggers complex signaling to the nucleus where DNA and RNA manufacture the necessary materials. How thought can trigger many different complex genetic mechanisms in multiple parts of a complex circuit is unknown. How can many varied simultaneous types of neuroplasticity be coordinated? Where is the center? No brain region has emerged as a center to control or coordinate this widespread activity. Neuroplasticity, in general, raises the question as to where the coordination and stimulus is coming from. However, the fantastic array of neuroplasticity mechanisms that operate simultaneously in many parts of the brain make an even stronger case for mind as a potential coordinating factor. This post will describe some of the many different types of neuroplasticity that have been discovered. For a better understanding of the general topic of neuroplasticity please see post, Neuroplasticity Update and Primer. For details of these different mechanisms see the individual posts noted in each section below. The most studied neuroplasticity is long-term potentiation, LTD, in the glutamate neurons, which are the most important for memory and learning. Glutamate is the neurotransmitter in at least 60% of all neurons in the brain. There are many different types of glutamate neurons, but a major type for learning has two different receptors—AMPA and NMDA. When both of these receptors are triggered at the same time, the NMDA receptor opens allowing calcium to enter. This rush of calcium stimulates the production of more AMPA receptors, which travel to the membrane and produce the stronger signal for long-term potentiation or LTP. This lasting increase in the power of the synapse was the first mechanism discovered and for a long time was believed to be the only one. A similar type of synapse change is called long term depression, LTD, or a lessening of the bond. While at one time LTD and LDP were thought to be relatively constant once established, new understanding of memory shows that every time we re-remember something, by thinking about a past experience, we re-encode that memory in a different way. Most synapses have ongoing changes with remodeling, strengthening, weakening and pruning. Also, new synapses are made daily, even moment-to-moment. Another neuroplasticity mechanism alters the structure of the dendrite, specifically, the enlargement of the dendrite spine. The spine is the part that meets the axon boutons making the connection for a synapse. 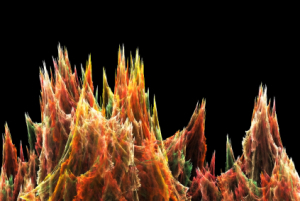 Larger dendrite spines means more ability to rapidly receive signals. The change in the spine is modulated by BDNF (brain derived neurotrophic factor) and estrogen signaling and is based on rapid changes in the scaffolding tubules. One stress circuit uses this type of neuroplasticity where the hippocampus becomes smaller and the amygdala larger. The postsynaptic density (PSD) is a very large complex of thousands of interlocking proteins in the post synaptic neuron. It is involved in determining the response to the neurotransmitter stimulating the receptor. Different regions of the brain each with multiple types of neurons all have varied versions of this critical structure. The PSD is altered in many different ways during neuroplastic strengthening of the synapse. These alterations are critical for neuroplasticity but are just being worked out. from either side of the synapse into the space between the pre and post- synaptic cells. 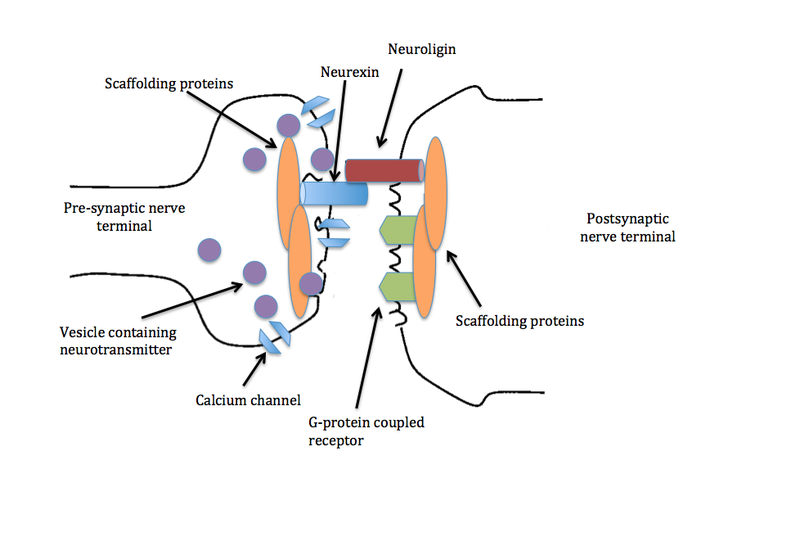 Significantly, neuroligins on the post-synaptic membrane meet the b-neurexins from the presynaptic membrane and shake hands, holding the synapse together. They hold the synapse together in different ways for different types of neuroplasticity. There are many different configurations with different neuroplasticity mechanisms. Receptors on the membrane trigger cascades of molecules that alter each other in turn down to the nucleus, where the genetic network response is triggered. Alterations in these cascades occur in various forms of neuroplasticity. When the cascade is altered then different material is produced by the genes. 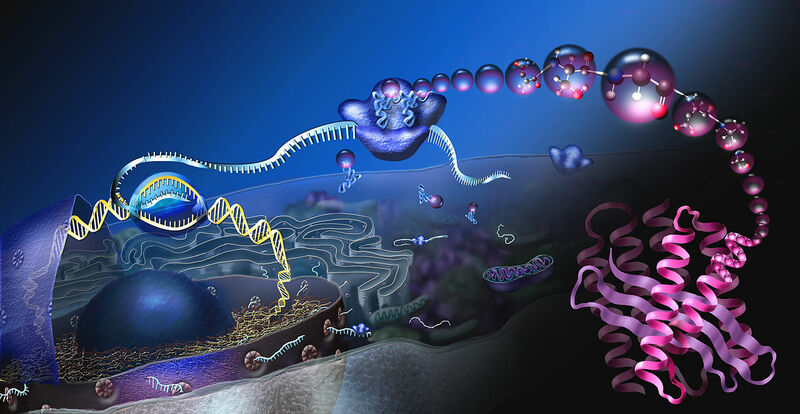 Transcription factors (proteins that affect the work of DNA) and small RNAs that affect many levels of genetic regulation are also critical in these forms of neuroplasticity. See post, The Life of a Thought in the Brain. The great majority of neurons in the brain are glutamate based and produce stimulation. Stimulation is balanced by neurons of inhibition, called interneurons, using neurotransmitters such as GABA. The balance of inhibition and stimulation can change the neuroplasticity. These alterations affect the neurotransmitters acetylcholine, serotonin, and dopamine. Many different types of inter-neurons in the cerebellum (Golgi, unipolar, Lugaro) have multiple mechanisms of neuroplasticity, which alter the synapses in different ways. 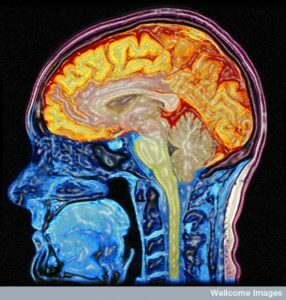 In the cerebellum there are many types of neuroplasticity for habit learning, also known as unconscious memory. One type is called intrinsic neuroplasticity consisting of alterations in the sodium and potassium ion channels in the neuron that make the electric spike signal. 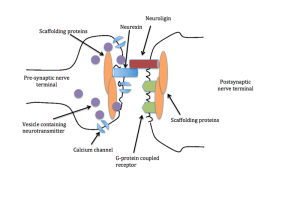 These ion channels trigger calcium at the terminal end of the axon, which causes release of the neurotransmitter vesicles. There are other neuroplastic alterations in the calcium signals, as well. Intrinsic neuroplasticity alters the process of ion channels in the membrane and has a major effect on motor learning. Some special forms of neuroplasticity employ many of these changes in the synapse structure at the same time and in different sequences. These simultaneous alterations can involve electrical potential changes, ionic channels alterations and different signaling molecules. In different regions these alterations occur in different sequences. 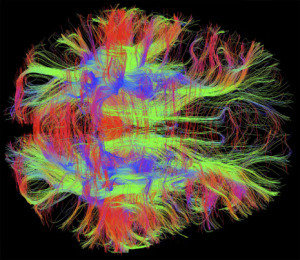 A totally different complex set of neuroplasticity mechanisms are involved in the climbing fibers of the cerebellum, the major fibers that connect vision, balance and movement. In the cerebellum the granule layer has the very small granule cell, which receives many kinds of fibers from the cortex and amygdala. These have a specific form of LTP. In motor habit learning (bicycle riding), there are multiple different neuroplastic changes in multiple layers at the same time. One type occurs in series, first the granule, then Purkinje; another starts first with the interneurons. Another type is cyclic between climbing and mossy fibers. Memories are distributed in this way to many other brain circuits. It was logical, but nonetheless quite surprising, when it was found that neurons could change both their neurotransmitter and complementary receptors as a form of neuroplasticity. It is logical because the DNA in every cell is the same and therefore any cell can, theoretically, make any type of neurotransmitter and receptor. Recently, many neurons have been found with a wide variety of different neurotransmitters receptors available. 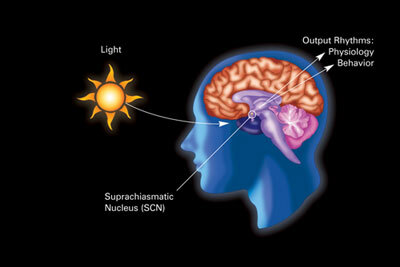 But, still it was surprising to find this switch of both the active neurotransmitter and the reciprocal receptor in the response to light and mood. The new form of neuroplasticity occurs with changes in the length of the day where dopamine and somastatin, and their receptors, change places, dramatically altering behavior. The neurotransmitters and receptors change when exposed to a long day (19 hours day, 5 at night – dopamine changes to somastatin) or a short day (19 hours night, 5 of day- somastatin changes to dopamine.). This process occurs in seasonal affective disorder. Another version occurs in the hypothalamus to alter pigment. It is not clear how widespread this phenomenon is in the brain. Interneurons have been found fluctuating from dopamine to neur-peptide Y. Another alters dopamine for GABA. There are a many different types of NMDA receptors based on the variety of four different subunits that make up the complex receptor. In each region, different NMDA receptors have different types of subunits and different properties. Recently, it was found that neurons switch out subunits of the NMDA receptor for different types of neuroplasticity. 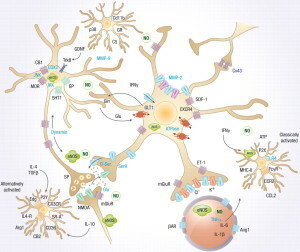 NMDA receptors are not just on post synaptic neurons, but, also, astrocytes, oligodendrocytes, and pre synaptic neurons. 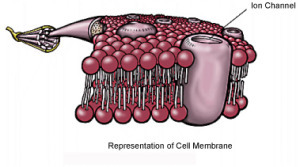 The subunits are manufactured and taken to the membrane where they are mobile along the membrane and can be switched in the receptor structure by the cell. The switch can alter the frequency of the neuronal firing from high to low as well as many other characteristics. Recent experiments erased specific memories in mice without affecting other memories. This was accomplished using the neuroplasticity of myosin motors. Specific inhibition of a particular motor during the memory changed the actin scaffolding related to the memory. There are many kinds of scaffolding molecules and many different motors that operate on this scaffolding. 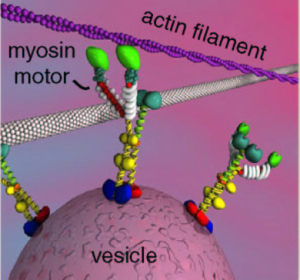 Myosin motors demonstrate a very wide variety of seemingly intelligent actions, very surprising for a protein molecule. The scaffolding is constantly changing, enlarging and condensing structures to accommodate the alterations in axon boutons, dendrite spines, and postsynaptic densities. Myosin motors operate with actin, which is used in muscle and brain. It builds a membrane’s moving edge and is critical for neuroplasticity. Myosins are critical in muscle movement and cellular division, and can work with the other motors as well—for carrying a large complex. The small tracks of actin are particularly suited for the rapid changes of neuroplasticity in the neuron. Of the seventeen families of myosin motors, there are 35 classes related to 40 genes. 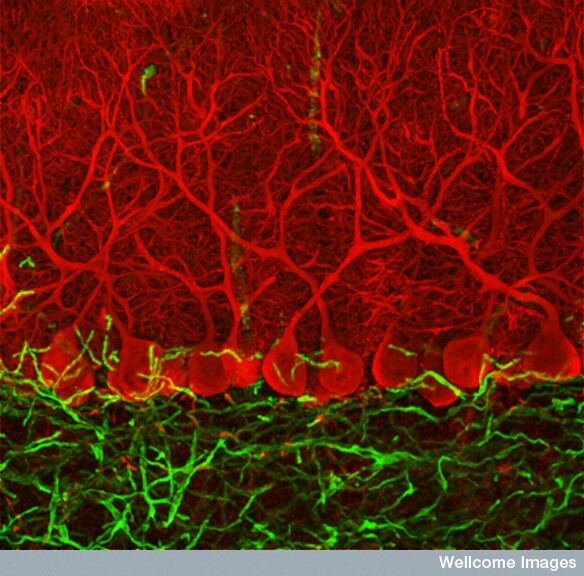 Three types are active in the brain in neurons and blood vessels. Alternative splicing creates many different versions of these three with very different activity and properties. 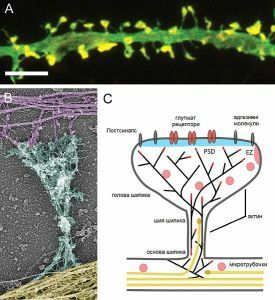 One type is in pre and post synaptic cells, especially dendritic spines and post synaptic density. Another type is critical for neurotransmitter release. It mediates the effects of BDNF. Myosin stabilizes the neuroplastic structures. It exerts force on structures to grow at the leading edge and take apart the rear, cooperating with several large proteins. How can the area outside of, and in between, cells be critical to the functioning of brains? How can the brain direct complex sets of molecules floating between the cells? In fact, extra cellular matrix is critical to neuroplasticity. It is difficult to imagine how molecules floating freely in the salty fluid (filling 20% of the brain) between cells, can respond to thought. The many large complex proteins of extra cellular matrix are not just a scaffold, but also an active participant in normal brain function and neuroplasticity. These molecules are secreted by neurons and other glial cells, but once in the space appear to act on their own. They are critical to the creation, maintenance and pruning of synapses, and critical in neuroplasticity. The extracellular space is partly controlled by electric gradients and fields. The total local potential, that is the sum of all of the different types of electricity from cells and molecules in ECM, appears to be critical for neuroplasticity and brain function. Neuronal activity can, independently, create all of the symptoms of inflammation—fever, redness, heat, and pain. In the past only pain was associated with neuronal signals. This type of neuro-inflammation is not based on response to microbes or injury. Neurons use these complex pathways for different types of neuroplasticity. Neurons trigger major inflammation in response to immune triggers or “para-inflammation,” a subdued version to use in neuroplasticity. The second type can involve signaling to astrocytes, microglia, T cells and vascular cells. Neuro-inflammation can increase metabolism in specific regions of the brain when needed for specific types of neuroplasticity. The neuronal pathways of neuroplasticity in neuro inflammation use a very large synapse including many cells—pre and post synaptic neurons, astrocytes, microglia, macrophages, vascular lining cells and T cells. These signals can come from naked unmyelated axons with sideways local communication. There can, also, be multiple different effects—one causing inflammation and one blocking it. There are different effects with low, medium and high activity. These different signals stimulate or inhibit various types of neuroplasticity. 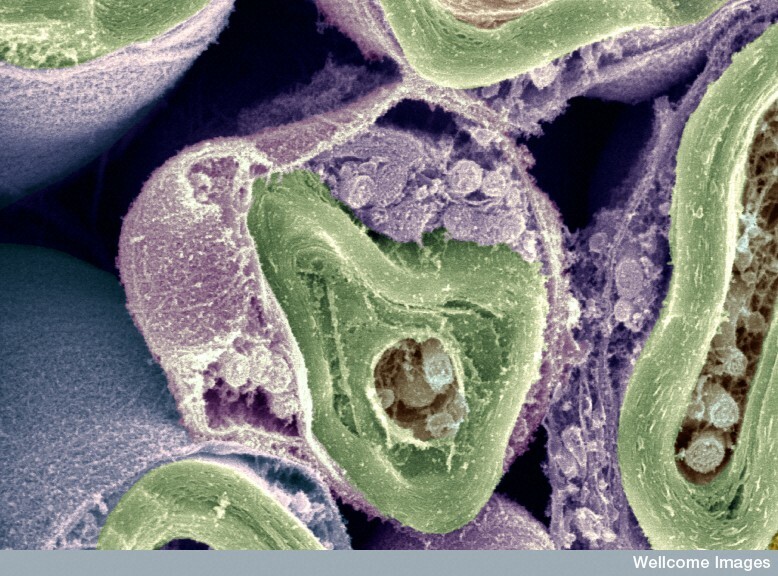 All cells, including neurons and glia, have a little known structure called the primary cilium. The solitary complex structure, unlike the motile cilia, does not move. It has elaborate transport in and out and has many elaborate receptors and machines. It serves as a sensory antenna, receiving information about external events. It is, also, vital for communication with other cells. There are many specialized versions of this throughout the nervous system, including for hearing, sight and smell. 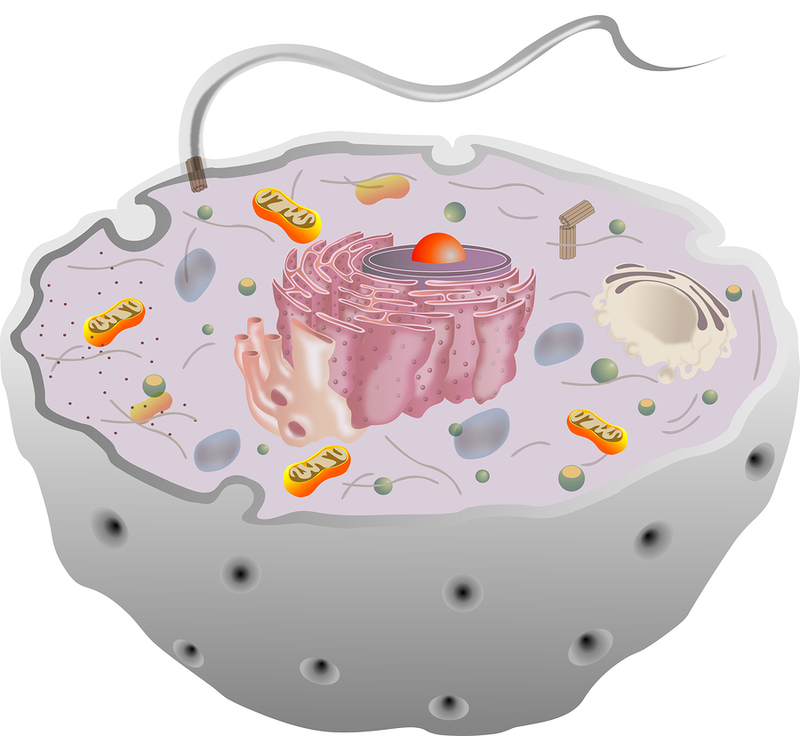 It has a very important relationship to the centriole spindle that directs cell division. In neurons, the primary cilium is critical for fetal brain development and later for neuroplasticity. Microglia have been called the most intelligent brain cell (see post). They are vital for all synaptic functions and for critical brain immune surveillance. Microglia are critical for neuroplasticity and for the development of synapses. Many experiments show the dramatic rewiring of axon/dendrite connections during any changing circumstances. Microglia prune unnecessary synapses to maintain optimum neuronal function. When the dendrites are shrinking, microglia are present to eliminate the unnecessary ones. When the dendrites are growing, the microglia move away and continue their surveillance. Microglia, also, signal to stem cells to make more neurons and glia. 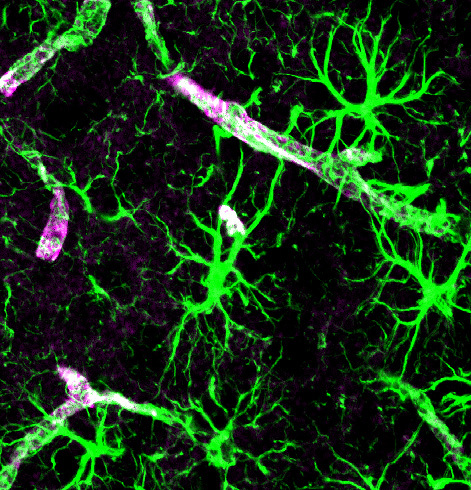 Astrocytes establish, maintain and prune synapses. They make up half of the brain in a large network—much greater in number than neurons. They create a huge scaffold that, also, sends signals critical to the function of neuroplasticity. Astrocyte send electric signals using calcium fluctuations, not sodium and potassium as in the action potential of the neuron. Astrocytes are named after stars, because they have many arms that touch and connect with a large number of neuronal synapses, as well as feet that wrap around the blood vessels determining blood flow in the brain. 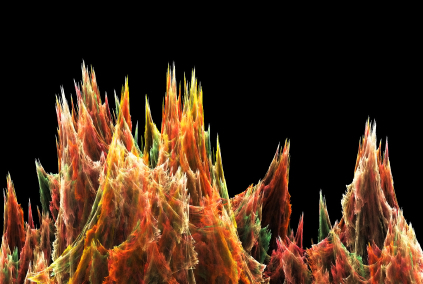 Astrocyte calcium oscillations are extremely complex. 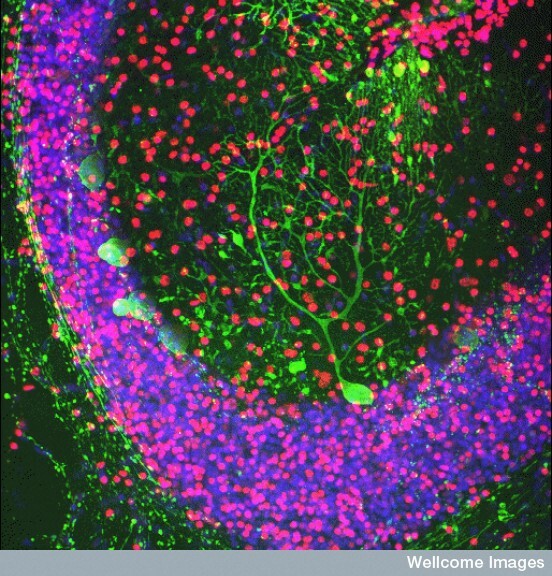 Along each arm there are many different compartments that have diverse types of signaling to the adjacent neurons. Different types of neuroplasticity are stimulated by different types of calcium signaling from the astrocyte compartments lying near the synapses. The activity in the cell body is distinct from the compartments along the arm. Specific frequencies trigger different responses—small fluctuations stimulate glutamate powerfully. Neuroplasticity of long-term depression is triggered in the cortex with specific calcium circuits and mechanisms. 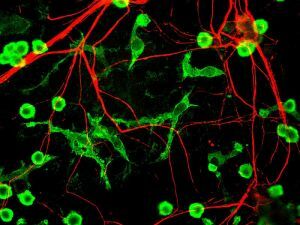 Astrocytes can bridge the many different neuroplasticity mechanisms in the large circuits since they receive information from thousands of synapses at once. Astrocytes, also, signal to stem cells to make more brain cells including neurons. New brain cells, now demonstrated in three different brain regions, are a major part of neuroplasticity for learning. In fact, the three regions are all very involved in new learning—the hippocampus, the striatum and the olfactory bulb. 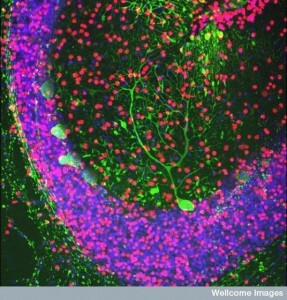 It is extremely difficult to find a small number of new neurons in other regions, so new neurons may be produced in many other regions, as well. Memory and new learning are clearly correlated with new neurons. The new neurons have specific functions in learning. Pattern separation forms new neurons from memories based on differences, such as comparing the difference of two houses. The newer cells, also, have more widespread connections than older cells. BDNF, involved with glucocorticoids, is a trigger for new cells. Chronic stress and aging decrease the formation of new cells. Many activities, such as exercise, psychotherapy, enriched environments and learning, increase new brain cells. During depression there are less new cells; with treatment by either psychotherapy and medications there are more. Microglia and astrocytes are, also, critical in directing stem cells that create neurons and all glia. 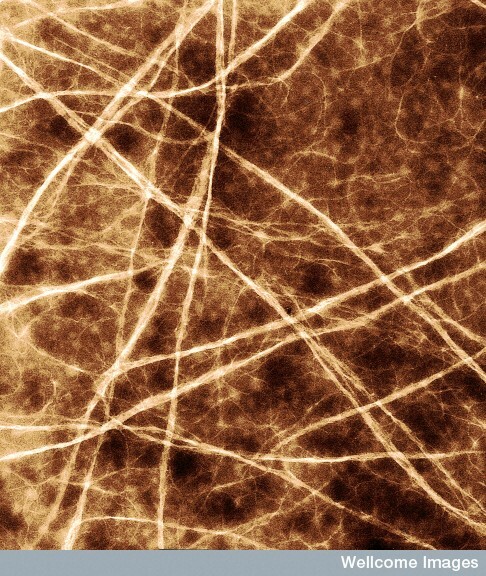 Different forms of electricity affect neuroplasticity in many different ways. Electrical synapses have recently been shown to be critical for all synaptic structures; they are first modeled as electrical synapses and then the physical chemical synapse grows in the pattern pioneered by the electrical synapses (the flow of electricity). Electrical synapses can trigger synchronous waves and can cause currents in the extracellular medium affecting synapses and neuroplasticity. Other electrical currents include synapse effects, calcium spikes, action potentials, and the after potential of the spike. The potentials, gradients and fields all affect neuroplasticity. Electrical synapses, and mixed chemical and electrical synapses, are much more common in the brain that previously thought. They work together in neuroplasticity, with the electrical effects being more rapid, stimulating the later chemical structures of neuroplasticity. They are especially common in the hippocampus related to memory. It was thought, until recently, that myelin was just an insulator to make faster signals along axons. While it does make communication faster where it is necessary, new information reveals much greater complexity in the ways neurons use myelin. Myelin is utilized for neuroplasticity by making different patterns for different purposes. Un-myelinated naked axons communicate locally to immune cells, glia cells and regional cells for specific purposes, using cytokines and neurotransmitters. 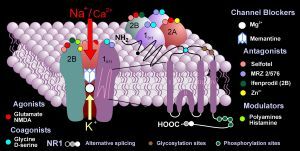 In addition the electrical field potentials, along with the shape of cells, the extracellular matrix and calcium spikes all play a role in this very complex communication. The myelin patterns, in fact, are different in each brain region, especially each of the six layers of the cortex. It appears that, like astrocytes and microglia, oligodendrocytes are making critical decisions about neuronal functions, including what types of signals will be utilized. Neuroplasticity, triggered by mental events, occurs in large circuits connected through many brain regions. In milliseconds, each region simultaneously uses many different neuroplasticity mechanisms. Different types of learning utilize different brain connections and very different neuroplasticity circuits and mechanisms. 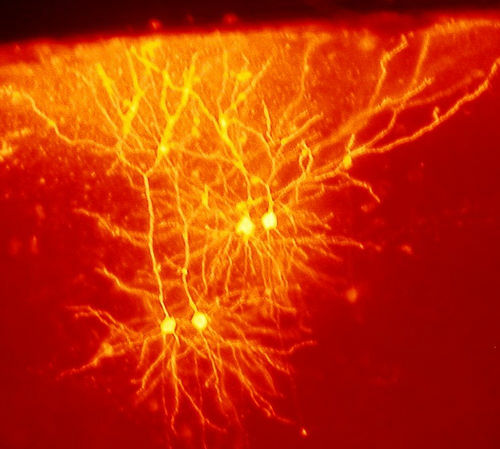 The same neuron that is part of one circuit, can be part of a different circuit a millisecond later, using different synapses from the 10,000 available to that one cell. Each synapse can be part of different neuroplasticity circuits with varied mechanisms. Neuroplasticity takes charge in situations where one type of sensory input or motor function is altered. What is the force that demands that other regions of the brain change their focus in order to be used for another purpose? What is the force and where is the direction for the woman without a cerebellum to use other brain regions as if they were a cerebellum? Where is the center of this neuroplasticity activity? Where is the direction for these far-flung mechanisms in wide circuits all through out the brain? Thus far no brain region has been found to bring all of this activity together. Is this coordinating function the mind interacting with the brain? This entry was posted in Blog, Neuronal Plasticity, Human Brain and tagged Neuroplasticity occurs in wide brain circuits, Neuroplasticity changes synapses in wide circuits, Many new forms of neuroplasticity, Neuroplasticity from neurons stimulating inflammation, neuroplasticity by switching NMDA subunits, Neuroplasticity by changing neurotransmitters, Neuroplasticity by electrical synapses, Microglia stimulate new brain cells, astrocytes stimulate stem cells to make more brain cells. Bookmark the permalink. There must be an overall operating system in play with a complex and flexible rule base. This must be coded into the DNA of each and every cell, because if not, then we´re just scratching the surface of a much larger and more complex system. We must start on the surface then more and more digging further. Lets make a statement :Different control mechanisms allow ‘feedback looping’ and hence robustness of the overall “machine”- as demonstrated for example the components of the ‘endocrine system’. As a second step , one could postulate that these redundancies of the CNS ( as described above ) , point to the need and importance of ‘robustness’ too . To extend this postulate quite far : firstly consider that the (as yet to be determined) type of ‘nuts ,cogs and bolts ‘ – most probably directly impinge upon the phenomenon of language/linguistics . Secondly , academics characterise human language syntax as having the important ‘property’ of ‘recursion’ ,i.e. ‘the output of one phrase-unit can be the input of another unit . QED ; this is in fact the (de facto) feedback we postulated to begin with. Were I am putting scientific documentation that refere to this. The psychological approach of Gestalt and the physical correlative of holography are apt metaphors for the this principle referred to here. However, the fact that this principle is “merely” metaphorical does not detract from the necessity for scientific research to comprehend it. The bifurcation of “hard” science from the “soft” arts has always been mistaken.